Many landscape photographers fly into Las Vegas, most headed for Zion, Bryce Canyon and Death Valley but there are other smaller photographic destinations in the area. Valley of Fire and Red Rock Canyon are often a pit stop for many of us photographers that want to add a little more variety but there is an abundant amount scenery in the area besides what I have just mentioned. The Rainbow Gardens Geologic Area on the east side of Frenchman Mountain is amazing and it’s layers of ridges fold into the Lake Mead Basin. This is also where the spectacular Grand Canyon ends but the scenery keeps going. This is one place you can see the endangered big horn sheep drinking water from the Colorado River in the Mojave Desert. How did I even end up in Vegas? This was somewhat of unplanned outing for Memorial Day weekend. I don’t visit Las Vegas much anymore but every now and then when one my friends has a bachelor party. This time my girlfriends parents offered me and Christina their timeshare, I wasn’t going to turn them down when offered a very nice room that I didn’t have to pay for. After waking up late in the morning to the bright sunlight entering the room I skipped out on a hungover afternoon at the pool and drove out past the Rainbow Garden area in hopes of finding some nice canyon narrows that I had researched earlier in the week. I parked at the mile marker and hiked along a trail that dropped into a wash that lead into the narrows. It was hot out and my 32 oz. of water didn’t last me as long as I’d hoped it would. Amazed at the length of the narrows, almost a quarter of mile long with walls rising hundreds of feet. Parts at only 6 feet across with light only getting better as time passed. The place wasn’t even an hour outside of Downtown, that’s golden for us that put in the miles to find these far off places. 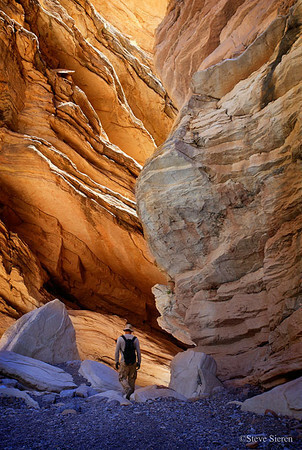 There must be so many beautiful canyon narrows that exist out there besides the ones we’ve all heard about. 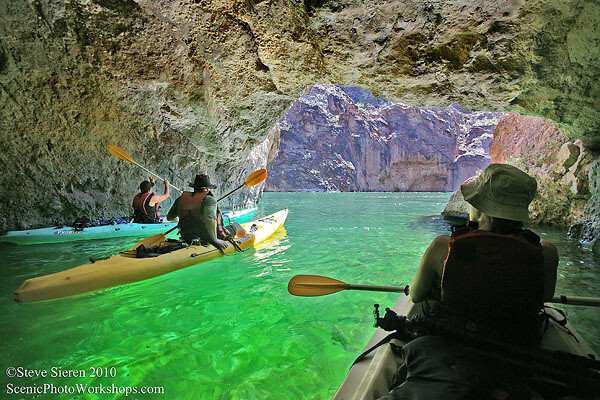 The following day was spent out on the water kayaking in the Lake Mead area. I’m not a kayaker so the first few miles the kayak floated like a log on the river while we physically remembered how to get around. These new things are what keep the drive alive for me so after a few miles of steering the kayak became second nature. I really wanted to try something different and to see the big horn sheep in it’s own enviroment but we didn’t see any until later in the day. They were far way on the other side of the river, you could see their trails that they walked from the slopes to the edge of the river. All paddling ceased and the current took us down river as we just watched. One of them stood on a rock out crop with out a single movement as if it were his or her pedestal. They blend into the landscape so well it was the movement of the other sheep below that caught my eye. We could of easily paddled on over and switched lenses but disturbing an endangered animal was not my cup of tea. Monday evening is when the first photo in this series was taken. Another one of those mysterious places out in the Mojave where the edge of a sandstone cliff is full of wind sculpted formations that look like they came out of a fairytale. The weekend was almost a fairytale being that I got to mix my social life and I was able to get 3 days of landscape photography, this never happens. There are more photos but I can’t process everything. Just for kicks here is the fairytale version of this photo, the place is just unreal and I could see why someone might want to go all at it in photoshop when visiting a place like this the imagination can run wild! I couldn’t help it I just watched Alice in Wonderland II yesterday evening. This entry was posted on June 7, 2010 at 8:21 am and is filed under Uncategorized. You can follow any responses to this entry through the RSS 2.0 feed. You can leave a response, or trackback from your own site. The Raptor’s Flight image is fantastic! 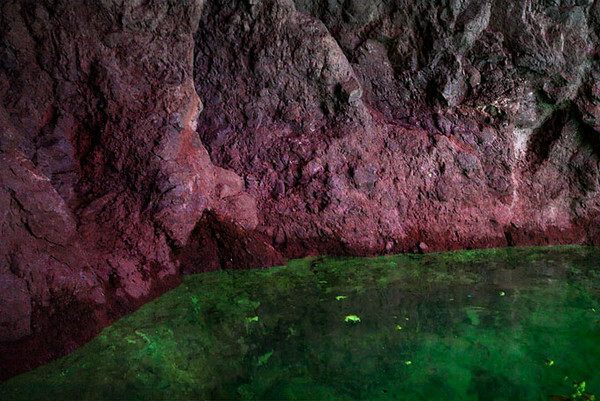 And I like the inclusion of people for scale in the Colorado River cave, that water looks so inviting! That second shot is great! Amazing that such a place exists so close to vegas. The person adds a great sense of scale. Thanks guys, Floris, I almost had a good candid of you coming out of that canyon in Anza Borrego but you were in such a rush you blurred. Derrick, there was plenty of saturated scenes out there. 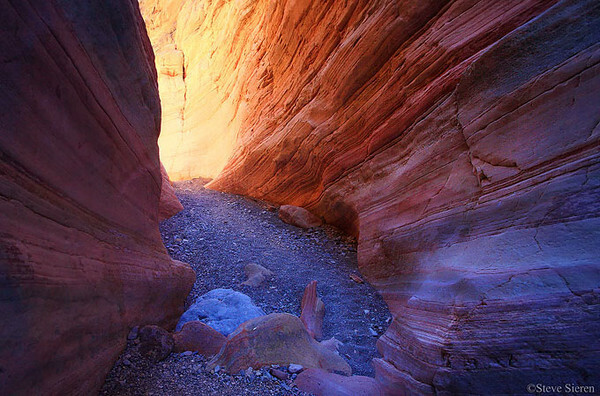 I uploaded an unedited video that shows how nice the color was in the shade in the slot canyon. As for the water and the red rocks you should really see it someday. Great article. I often stop at Valley of Fire as a slightly less hot stop on the way back from Zion, especially because that’s often about as far as I have the energy to drive after some of Zion’s hikes and waiting for sunset there. But the Las Vegas area certainly deserves more attention and exploration. Thanks for taking us on a “virtual tour”. Sounds like a great holiday weekend trip! Photos are awesome as well. I like those places where you can do the leisurely stuff in town but also get out to do serious nature photography just outside of town. Jeff, this hike is so mellow compared to the lengthy canyon hikes you can do in Zion and the elevation gain is minimal. Richard, I was originally supposed to leave this area and for North Eastern Caliofornia and I just might do so since I finally got my camera back from repairs today. I only get to hike with my signicant other on the weekend. Nancy, thanks for linking. Tell wise old Hutch I say hello and everything he says about me is true. I didn’t know crap until I met him. This is a nice report on the unheralded spots around Las Vegas. It seems that it’s pretty tough for some photographers who travel all that way to cram in all the hot spots from Death Valley to Bryce but places as picturesque lie much closer to Vegas. Hopefully I make it back down that way in a year or two and can check some of these spots out. Thanks again for the report. Wow Steve. Probably my favorite blog posting if yours. Very motivating! Viva LV! Here I come!!! Thanks, lot’s of stuff out there for short day trips and longer! Nice job, & thanks for the experience. my wife & I are going out to vegas the end of the month it will be are first time to explore out side of the city. 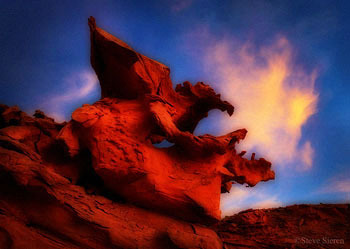 Valley of Fire is a fantastic place for photography at sunrise and sunset. Red Rock Canyon is another place you’ll love but there are restrictions on the hours of operation that may not cooperate with time of sunrise or sunset. You’ll have to check with the office. There are many other places but the photo opps are not as easy to photograph as Valley of Fire. 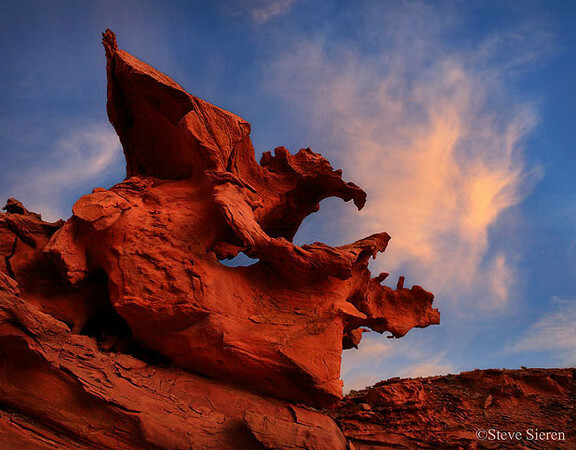 Looking forward to photographing Valley Of Fire & Red Rock. Will have to check out Rainbow Gardens now. Appreciate the recommendations. Thanks for letting us peak over your shoulder via video!